Each year the Monks of the Most Blessed Virgin Mary of Mount Carmel invite pre-approved single young men ages 17-32 for discernment retreats. These retreats will allow you to experience the daily life of the Carmelite monks by participating in the monastic Liturgy, working in the fields and workshops with the community, and attending recreation with the Fathers and Brothers. The Carmelite Fathers will give many sermons explaining our charism and how a young man can discern his vocation to Carmel. There is also the opportunity to meet one-on-one with the Carmelite Fathers to further discern your desires for Carmel. During this five-day experience, you will have an opportunity to come to know the Carmelite monks of Wyoming and the contemplative life they lead that you may discover your own vocation. These vocation retreats can only be described as a gift as very few people get to meet cloistered religious. It allows you, our candidate to explore the life and charism of the Monks of the Most Blessed Virgin Mary of Mount Carmel. 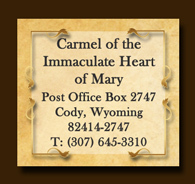 You have nothing to lose, and much to gain by spending this time away in the mountains of Wyoming with the Carmelites. 1) A desire for our contemplative Carmelite life. 2) Contact the Vocations Director who will speak to you about your interest in our community. If the Vocation Director believes that you might have a vocation, you will be invited to discern further. 3) You must fill out our preliminary questionnaire that the Vocations Director will send you to be approved to come on retreat. Yourself, Bible, Rosary, Work Clothes, Sunday Mass Clothes and Shoes, and Work Boots. Because space for vocation retreatants is limited, it is recommended that those interested call to inquire about openings as soon as dates are made available. In order to register for the upcoming vocation retreats, it is necessary to complete a brief initial Questionnaire that can be found on the "Formation Process" page of this website. For more information, Contact the Vocations Director. Since discernment is a mutual process of prayer on your part and the part of the community, a vocational retreat will allow us to come to know one another better. While you will have an opportunity to learn much about the Carmelite charism and to have your questions answered, the monks will be able to speak with you directly to see if you possess the primary prerequisite necessary for the monastic life: namely, the aptitude, desire, and docility to be a good spiritual son. A Carmelite must have the willingness to receive instruction from those who have lived the Carmelite spirituality and way of life for decades. Can you imagine a candidate for the Navy Seals showing up and telling the instructors "how it ought to be done?" During your vocational retreat you will meet with Father Prior, Father Sub Prior, and the Vocation Director who will discern with you if indeed Our Lord might be summoning you to the religious life of Carmel. These vocational retreats are a time of grace for the candidates and it is beautiful to see the hand of God through it all. Those who trust in God and listen to His voice within the depths of their hearts will always discover His designs for them. Be assured that the monks are praying for you at this pivotal moment in your life!